In the world’s free fight? I have come to realize over time that each of us as individuals are made up of a combination of unique interests and characteristics that often seem unrelated, random and sometimes even in direct contrast with one other. If you are truly being honest with yourself and not trying to play a role that you know others will approve of, you may discover this about yourself. After years of trying to come to terms with how I could equally love the untamed outdoors with the messy hair, dirty fingernails and wood smoked clothes that go along with it, as well as the the glossy, camera ready glamour of fashion, I discovered that our strengths lye in embracing the strangeness of ourselves! Our unique combination. Instead of resisting the weird contradictions of the things I love, I began to embrace them as “myself”, who I truly am, whether it makes logical sense or not. When I say embrace, I mean that I did not second guess my natural desire to be true to myself as weird or wacky as it might seem to others. 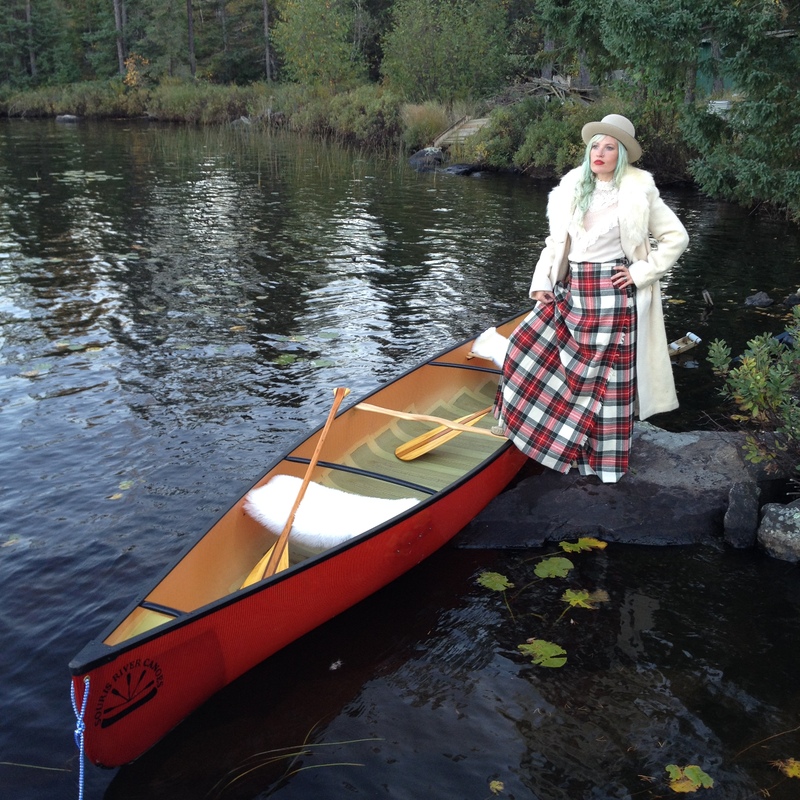 For example, when an overwhelming desire to wear vintage lace, Scottish tartan and paddle a canoe at the Lake occurs, I go with it! It’s truly incredible what happens when you give yourself permission to be you. You discover a flow and purpose you never knew you had and somehow, it just works! 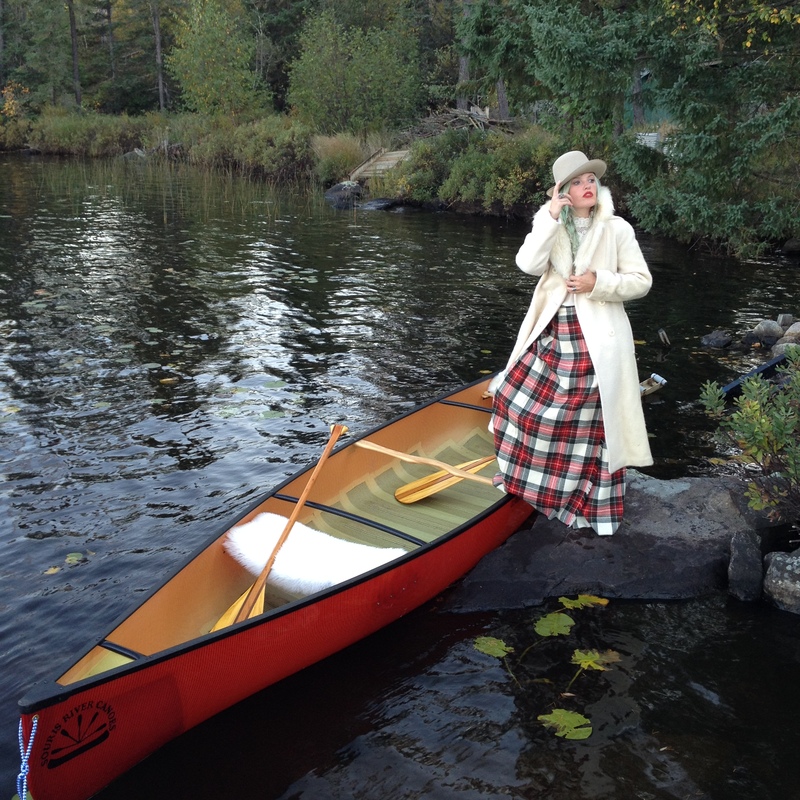 And so the expression goes, “paddle your own canoe!” ,I dare you! Vintage: lace Victorian-inspired blouse, tartan skirt (made in Scottland), felt hat, Afghani carnelian and silver earrings, wool Hudson’s Bay coat. Thanks Pam! That poem is so great isn’t it? It was a perfect addition to this post.